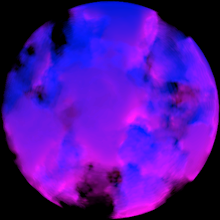 The 3D Sphere at the top of this post was created by me in Blender where volumetrics were used to create that of a 3D cloud, an effect I’ve struggled to create in other 3D apps. It actually didn’t take me as long as I thought, do I’ll see if I can start making future images with it. I mainly used this page as a guide to creating it; Blender’s UI is still taking some getting used to, but seems well worth the effort. This entry was posted in Uncategorised and tagged blender. Bookmark the permalink. Love the eaves class. The city ships (mother ships could be widened and flattened to become a super saucer for a large intergalactic trek ship. Any thoughts to doing a McQuarrie planet of the titans enterprise? Sorry for not getting back to you sooner – that is a great idea, no I hadn’t thought of it – but it definitely is a project for the future!